Relax, Renew, and Refresh with the Harmony 20 Red Light Therapy Bed. The Harmony 20 gives you, your own day spa experience from home. Red Visible Light delays the aging process by minimizing troublesome fine lines and wrinkles. The Harmony 20 helps to naturally stimulate the production of collagen, elastin, and other proteins essential for youthful healthy skin. With 15 minute sessions, you will find the fountain of youth can plug directly into your regular household outlet. Sunco offers the Gold Medal warranty and with our quick, easy financing you can own your own system for as little as $2.00 per day. For more information call us at 1-800-382-8932 today. Red visible Light Therapy is becoming more and more popular as a potential method of natural, non-invasive skin treatment. Due to the feeback, testominals and ongoing RVL research Sunco continues to further develop this totally new model offering RVL for the entire body. And that’s what the Harmony 20 offers! Enjoy Your Very Own Day Spa Experience At Home With The Harmony UV Free Red Visible Light Bed! All SUNCO Tanning beds are ETL tested and certified for your personal safety and peace of mind. 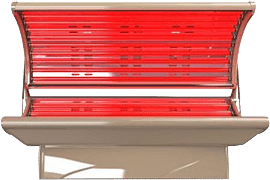 Wow this therapy tanning bed is great and the price was unbelievable – almost $1200 cheaper than a similair model at another site. We formed our own club of middle aged women who wanted to take better care of our skin, and look younger. It is a hit and we all love it. We are careful to follow all suggestions and couldn’t be happier with our results. Just can’t decide whether to tell other friends how we do it. We have added this to our health and beauty day spa and it is rapidly becoming our most popular offering. It has increased our traffic and added to the use of some of our other offerings. This addition has more than paid for itself. Recently had red light treatments as part of my therapy and became such a believer I decided to incorporate in the gym I run. Boy has it become really popular. Should have done this years ago, but didn’t understand it’s importance back then. Our gym will never be without it now. Spent a lot of time studying the health effect of red light therapy and decided to invest in this unit. My time was well spent, and you helped further my education. This unit is wonderful and I’m so glad I took this step.